A couple of weeks ago, I started taking guitar lessons. 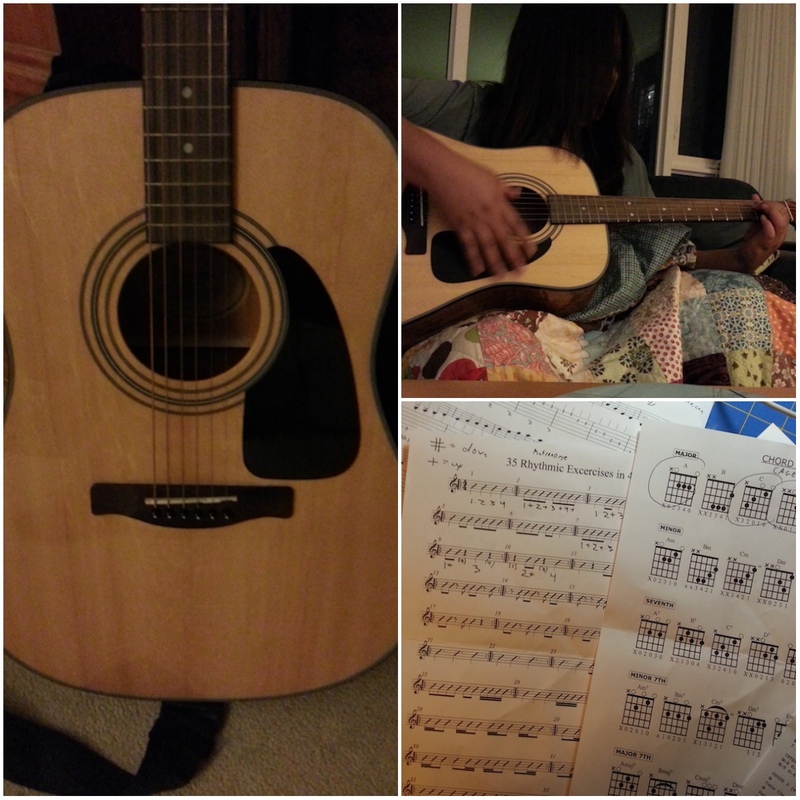 I'm extremely excited about it and have been practicing so much my fingers bled. That's not really true, but they hurt. A lot. I can understand why they say that. But it's so worth it. It's so hard. The hardest thing I've tried to learn since college. I don't have dreams of taking the stage with my favorite rock band, but I'd love to pull out the guitar while everyone gathered around the campfire roasting marshmallows and be able to break out a little Kumbaya. I started some guitar lessons from my folksinging friend many many years ago and actually got to be able to strum a tune (only one! ), but I know what you mean about fingers hurting. And I decided that I'm not musical, so my son has my guitar now, it hangs on the wall and gathers dust. Keep it up.... I'm looking forward to your audition on American Idol. I say go, go go. I wish I continued. When I was young, I was taught by my brothers, who played, and after I learned to play 2 songs I stopped altogether. I wish I didn't. I found it engaged parts of my brain together that were not ready to engage. Too, too hard for me. Though it was fun to play with my son and his girlfriend, they kept it moving and I maybe threw in a chord or two. Some people have it, but I did not. As long as you enjoy it, keep it up!It was a good experience in humility. Good for you, Mad! I tip my hat to you and wish you much success. Based on everything else you do, you'll be a real strummer!